John loves nothing more than explaining to folks how to do things themselves. Back when we were faux finishers, he would frequently talk himself out of a job by encouraging ambitious house wives to faux their own bathrooms, or re-finish their own furniture. So I had to laugh when he came in from the garage last week and asked, "Hey, do you think your Epbot readers would want to learn how to do this?" I think this blog is growing on him. See how the print is elevated off the wall on that wood frame? That's what I mean. We made this one for our bedroom a few years ago. (Yes, my bedroom is orange. 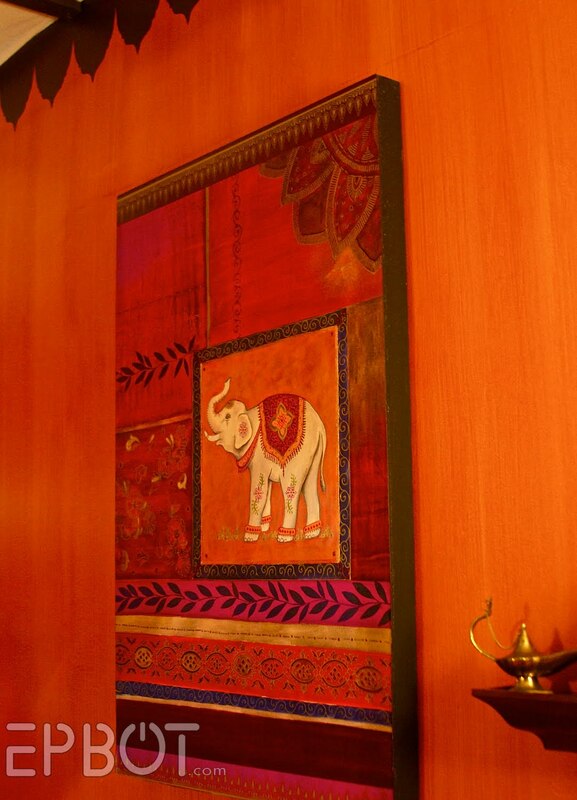 And has an India theme. Like you're surprised.) For just a few dollars' worth of materials and a little labor we made it go from "el cheap-o poster" to "wall art." Ok. First things first: measure your painting/poster. I painted this Tigger a few years ago, but we never got around to framing it. 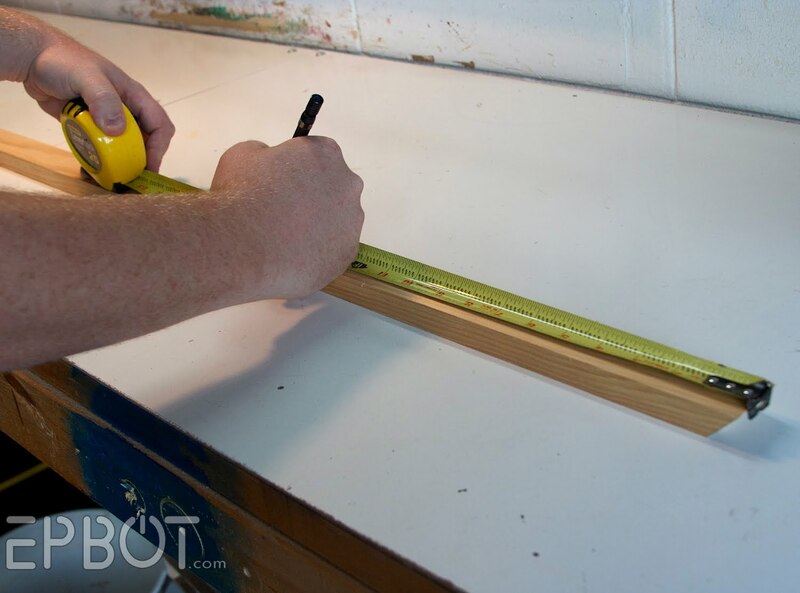 Your frame will need to be exactly the same size as your board, so be sure your measurements are precise. 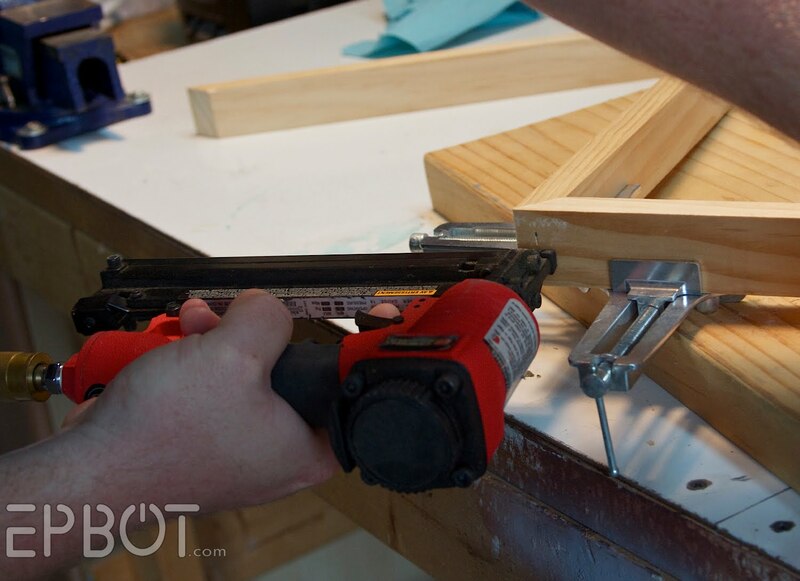 It's called a miter box, and the slots will guide your handsaw into the correct angles. You can find these at any hardware store for cheap. 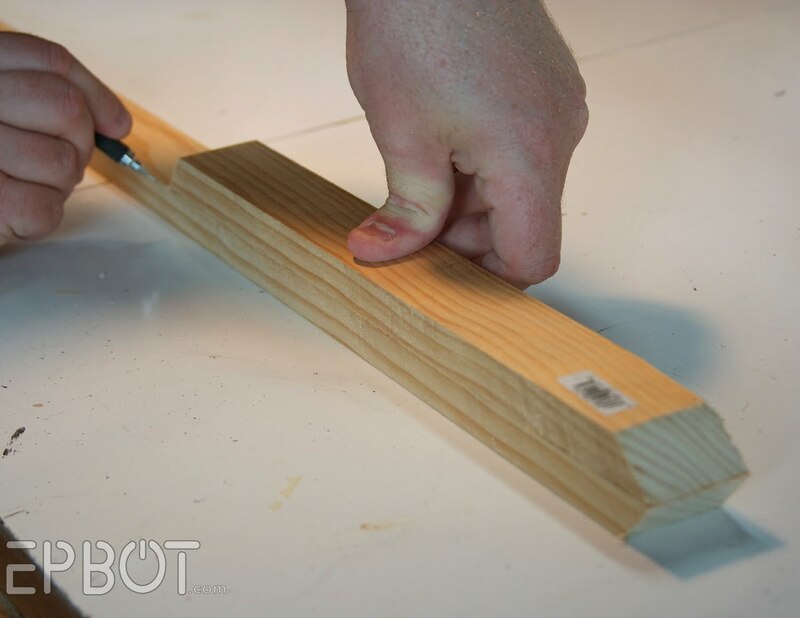 Repeat these steps for the other two sides of your frame, using your painting measurements as a guide. Just be sure to allow for the difference in your measurements. Since these frames will only be seen from the side, I wouldn't bother with the 45 degree angles at all, myself. John's just a perfectionist. And likes playing with his miter saw. You'll want about 2 nails on each side: 4 total per corner. Black is easy and goes with everything, but you could also use a complementary color from your poster or print. If your calculations were correct, your board *should* be a perfect fit. I find Harry Potter books to be very useful for this purpose. Quick update from john: Hi! A couple of you have noted in the comments that it would be good to use stretcher bars instead of a 1x2 because they are precut and perfectly cured so they won't warp. I would say that while they are precut, that really just limits the size you can make your frame. As far as curing, you should only buy the grade A stuff they sell at your local lumber store. It's usually cured and dry and I've never had it warp on me. It's also important to note the cost difference: 1- 8 foot grade A 1x2 = $3.00. 1- 2'x2' stretcher bar = $40 or more. It's a great tutorial but I stopped really listening at the India bedroom. Maybe some blog post we could get the full tour. What else do you have? Thanks, John! I feel as if I have been elevated to a higher level of understanding. This comment has been interrupted for the safety and well-being of readers everywhere. We'll be taking the lady back to her cell now, and advising the board to revoke her keyboard privileges. Thank you for your understanding. This is awesome! I usually buy a shadow box and glue whatever it is I have to the glass. And since my darling boyfriend is obsessed with the miter saw lately, I'm sure he'd love to try this project with me. Considering he refused to make this with me, I've been trying to find art projects he'd be interested in. He's sweet, he's smart and he's handy. What a keeper! I love the way these look. Going to have to try this (my version of "try this" is getting my hubby to do it. Close enough). Those look awesome. ^_^ I've got some prints I was trying to figure out what I should do with and that will be perfect. Thanks John! That tigger painting is ADORABLE!! And I totally need to try that to mount my posters, Thanks! Ooh, I just found a bunch of posters in storage, and while they might hark back to college, this will surely make them grown up, no? I'll be doing this as soon as I own awesome art that needs hanging! Being in rentals and not being allowed to hang things, I've steered clear of posters/art for this reason but this little trick i'll file away for later! Now I won't feel so bad about asking you how you put in your wood floor. I saw the photo you posted a while back with the blue tape on a half finished floor and had to keep talking myself out of asking for tips. The frame is nice, but how about a floor tutorial for someone who can't afford to fly John out to install it himself? Hell, if you lived near Austin - I'd just hire the both of you. John!! I love that do-dad, corner clamp thing. I even left the blog to go throw a couple into my amazon cart. They look fantastic. My dad has been puttering around with making his own picture frames, and this might help!! Thanks, John! Consider me educated. I think I'll stay away from the sharp objects, though. I can hurt myself with an unsharpened pencil. I can only speak for myself, but I LOVE these DIY projects that you guys undertake! 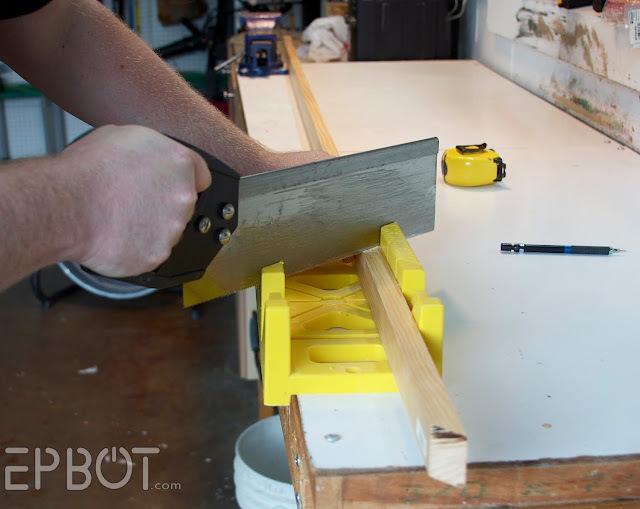 I'm so glad to know what that yellow thing is, a miter box. I keep going around the house and picking things up after my boyfriend and I never know what they are. I have picked up his miter box at least 3 or 4 times in the past couple of weeks. I love all the DIY tutorials! Thanks guys! Keep 'em coming! I'm thinking the craft-challenged could accomplish a similar look using canvas stretcher bars sold at craft and art stores. Take your measurements to the store and buy a pair for each dimension. 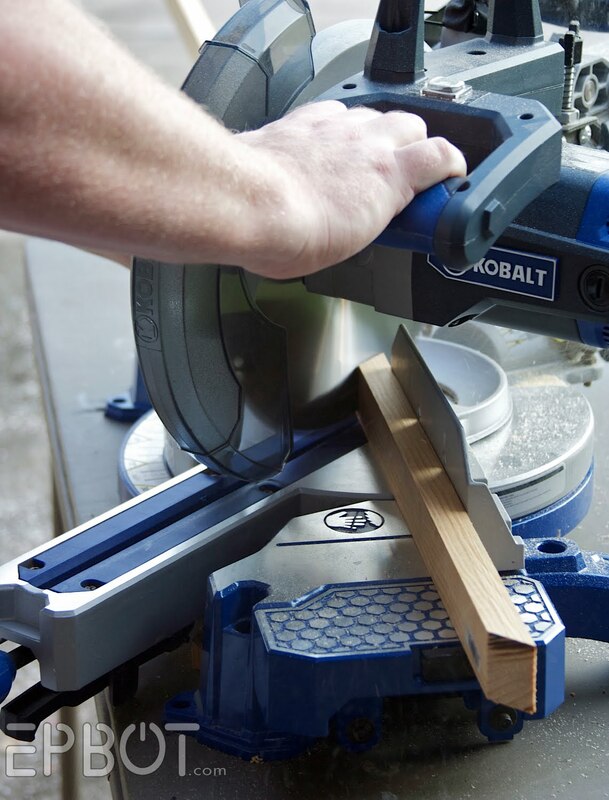 The wood bars are pre-mitered and precision-measured, and snap together with a tongue and groove system. Add a little wood glue, clamp to dry, spray paint, and you're done. The bars come in different thicknesses too, so you can have just a little or a lot of lift. A little more expensive than John's method, but doable by folks with no tool fu. Thank you, this is soemthing my husband who is not handy can follow and do. This housewife owes you one. OMG, that is wickedly cool and I KNOW I could do that. You are gonna get me in so much trouble with the hubby when I start buying all these new tools. I love this idea! How great. I also love the India bedroom. More photos of that sometime please? This is a wonderful idea! I can't wait to try it out! Ooh! Love it. I have a few prints to try this on. More from John! And the non-scary tool option is much appreciated. I have just the painting in mind for this project. Currently the canvas is being held up by thumb tacks...don't judge. But this simple project might get my hubby in the 'my man can make stuff' mood. Thanks! 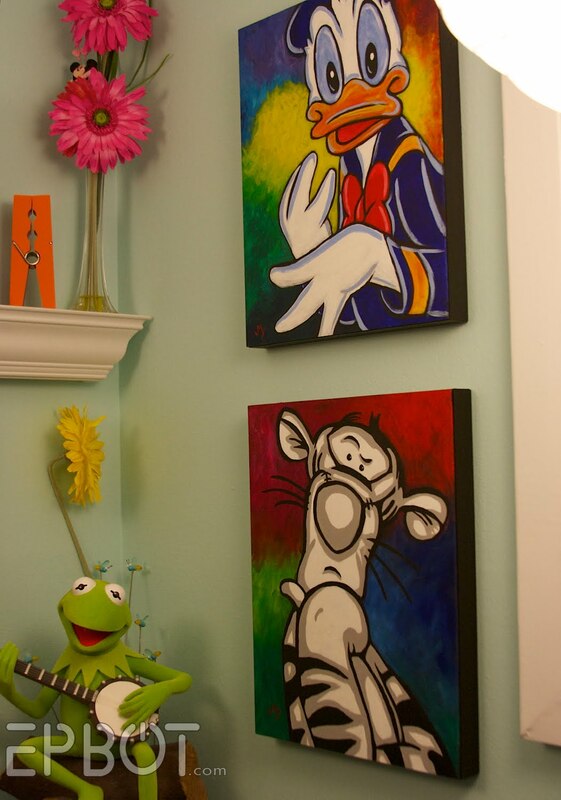 Your Tigger looks really amazing, and I love the way a flower seems to be growing out of Kermit's head. I'm completely shocking at any handypersonish type stuff, but I think that even I could do this. And it really does make posters look classy, I have a vintage Star Wars poster mounted on wood, kind of like what you've done, and it looks quite posh. One thing I need to ask, being a nonhandypersonish type of person - what's faux finishing? One: I'm saving this post so I can refer to it in the future. Two: You need to do a house tour! This is an awesome post! Thanks so much... I often fail at crafty, but I would like to try this with some of my posters. I also know some crafty friends who would love this! I do have one question... what would you suggest using to treat the posters to protect them or age them a little bit to change their look once they are on the wood? I love that John was informing house wives how they could save money by doing easy jobs themselves. I hope he makes more money giving us tutorials now; he certainly deserves it! Honestly, I have always wanted to know how to do this. My husband and I are "craftily-challenged" and even simple boxes look like complexities we couldn't possibly complete. This made me feel just a bit of hope! Of course, we can't do a project like this together because we'd kill each other... I have my summers off (college prof) and this is going to be my summer project! (Seriously... it will probably take me the whole summer...). We have some posters my hubby wanted to put in our sons room, this is a GREAT way to fancy them up. I was just going to throw them in a cheap frame, but this would look SO much nicer. THANK YOU! Sweet! Thanks for this! I think I've just decided what to do with those wall scrolls we bought at our last con! awesome.. hubby loves when I come up with new projects for his tools! Do you think you would be willing to rent out John? I have a project for my guest bedroom where I want to do a travel theme and I could use some help to make it classy yet interesting and the two of you do that so well. I will pay him and bribe you in non wrecked cake too! What do you use to glue the poster to the board? Is Modge Podge suitable?? ~I really appreciate that you included easier options for some of the steps. ~That glimpse of your office is so vibrant! ~That artwork fits perfectly in that space. ~ I can't believe that I've been reading Cake Wrecks for so long, but only last week ventured down to the very, very bottom of the page to see the EPBOT link. Thanks Jen/John! I have a bunch of stuff I'd like to frame without spending several hundred to get Michaels or Joanne's to do it. Will have to try this some time! Beautiful work, John. Jen is lucky to have you. 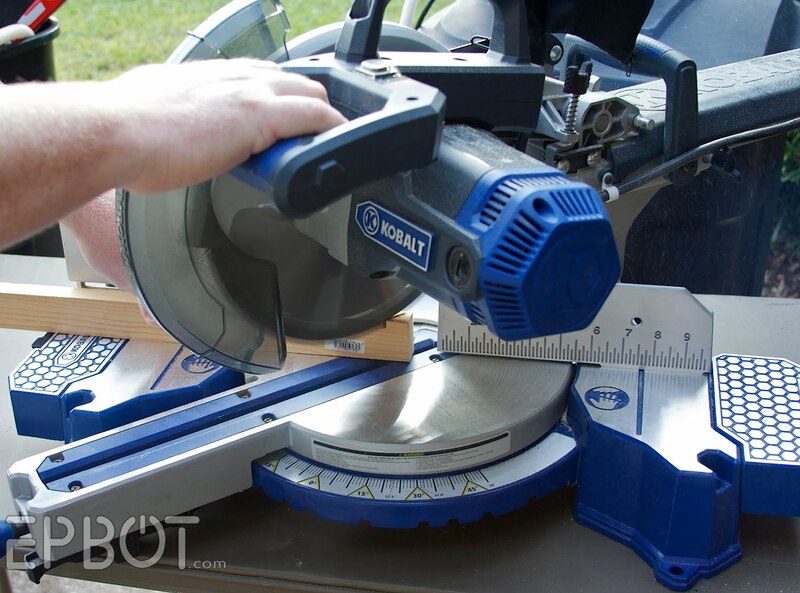 I know my hubs will someday also have a miter saw, corner clamp, etc, just as soon as we have a house. you make me hope all the more for that day to come sooner. Thanks, John! This is a great! I have often wondered what to do with some of my art prints that would be different than a regular ol' frame. Jen - You are a very talented painter! Oh my gosh- I'm gonna use this ide to frame and display all my "kid art" that my children have created for me! I am totally doing this. Thanks, John! Sure beats the cheap poster frames I buy at Walmart. Also, now that I know a corner clamp exists, I need to own one. I'm soo glad you guys posted this!! My hubby isn't always good with power tools (ever the artist, never the handyman) but this is something we could agree on and make quickly! Thanks so much!! By the way... has John ever thought about writing his own book about home repairs? I think it would look lovely on shelves! Thank you!! This is just what I've needed. See, I have two unmounted prints that I'd picked up a month or two ago. And to be honest, I didn't know how I was going to mount them but I thought it couldn't be that hard *(Until my procrastination flaw had a strong hold in doing anything with the prints). And now I know what to do, how to do it, and...I've got a miter saw. :-D Thank you John! My about to be a teenager daughter is starting her poster phase where she wants to hang all sort of things on her wall which looks really craptastic. I'm thinking that this project is an excellent compromise. ps Happy Birthday to the master craftsman! Bob Vila's got nothing on you. Your like Norm Abram level. I could do this to my odd-sized poster I bought years ago! It's framed, but it's one of those cheap ones that's too big for it (because I stupidly bought a poster that's an odd size). And I don't want to pay to get it framed professionaly because then that would mean the frame would be worth more than the actual print. Thank you, John, for this tutorial! I've found that Harry Potter books come in handy with DIY projects. My fiance and I put up a faux tin back-splash in our kitchen. We had one piece that just wouldn't stay down, it kept buckling outward and wouldn't lay flat so it would stick. So I wedged a harry potter book between our microwave and the wall overnight and it stuck! 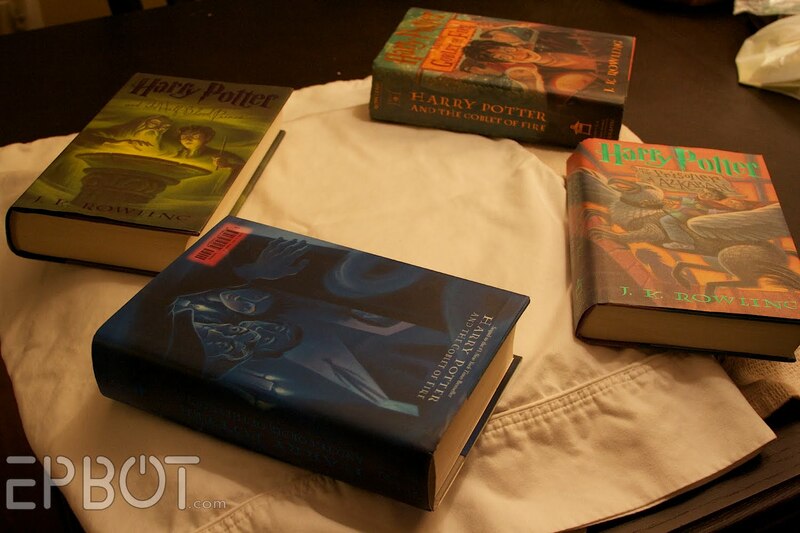 LOL - I use our Harry Potter books all the time to weigh down projects being glued! 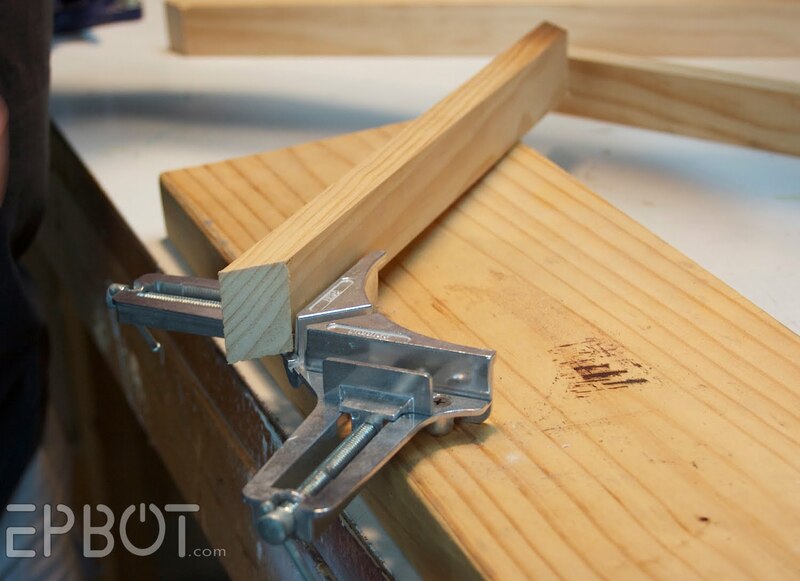 And thanks for the link for corner clamps. Hubby is in construction and does woodworking for fun too - he is always telling me "you can never have too many clamps"! I know what my friends are getting from me for xmas! Thanks John! My hubby wishes he was you (or maybe it's ME who wishes that) Love you guys a ton! Oooh! So crafty! So very, very crafty! This is a great tutorial, but as a custom framer I did want to point out something to keep in mind. 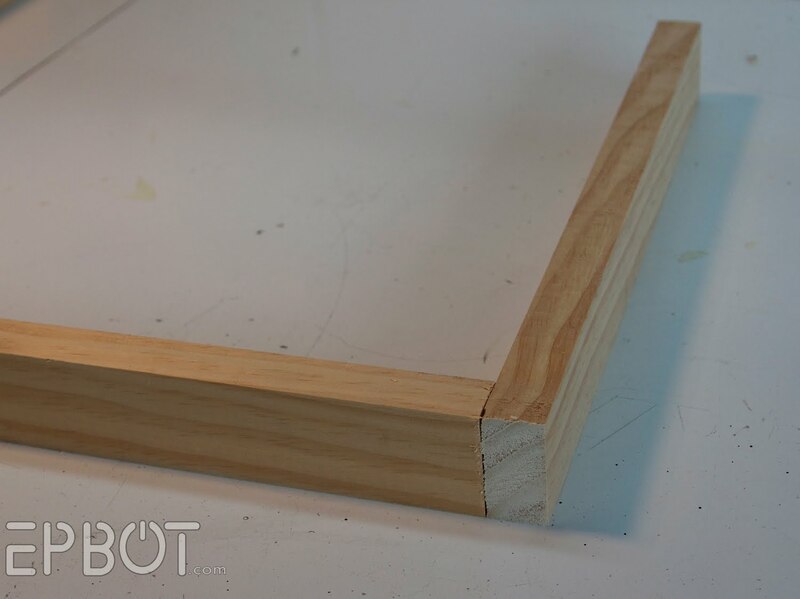 It may be worth your time to go with framing stretcher bars, like Texpenguin suggested. Part of what you pay for with real custom frame molding is that the wood has been kiln dried and prepared so it will not warp OR shrink. 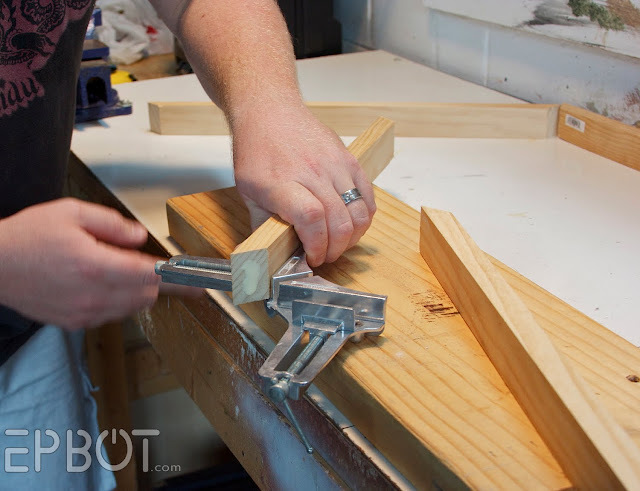 (most stretcher molding has still been processed this way, even though no where near as expensive as decorative frame molding) It's just that lumber straight from the store can often warp and twist over time. If you've got the time and space, even letting the wood lie flat in a dry space for at least a few weeks (the longer the better) would be a good plan. If you're going to put in the work you don't want the finished piece to twist or develop ugly gaps. Thank John for me! Now I know what to try out with the new miter box! I'm not the only one scared of vacuum cleaners?? Really and truly? Huzzah! Nice! That's so easy I could actually do it and probably not mess it up! hahahaha... saws do scare me, though... so yeah, I'll be using one of those yellow things... Good call! Btw, the giant orange clothes pin you have has a purple friend on my work desk. I put eyes on it and I make it talk and/or snap at people. Very useful. I have some glued puzzles that I've been wanting to frame, but of course they don't make frames in the sizes I need for my puzzles. This is a fabulous idea and I can't wait to give it a try!! Love the tutorial John, more please! Wait...what? That is SO COOL! I've been looking for faux finishing classes out here in Silicon Valley, CA for AGES! Any info or tutorials you want to post on here about faux finishing would be The Bees Knees. Thanks and enjoy both your blogs immensely. My favorite part is the update from John. ARE YOU QUESTIONING ME?!?! Oh thanks. I just mounted some paintings my daughter did for me using poster sticky hanging things. This would look so much better. And I think I could do it. Nice!! 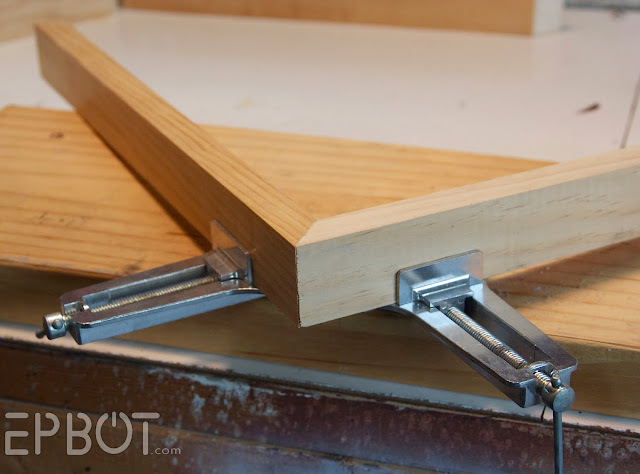 I lourve my miter saw and now I totally want one of them corner clamps or whatever they're called. I have a bunch of leftover crown moulding that I'm gonna make into big ol painted frames for canvasses and canvas board. 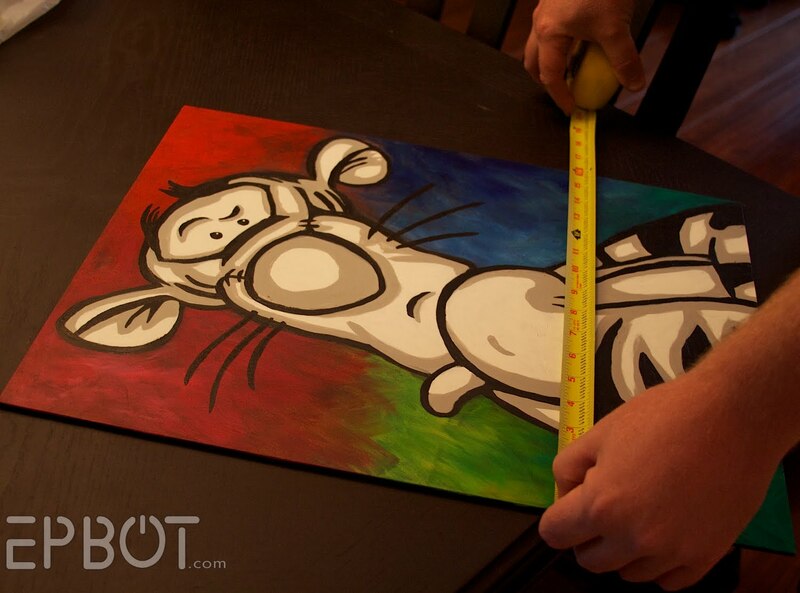 You could also use a thin board in place of the artwork. Paint it the same color as the sides of the frame. Attach velcro on the corners. 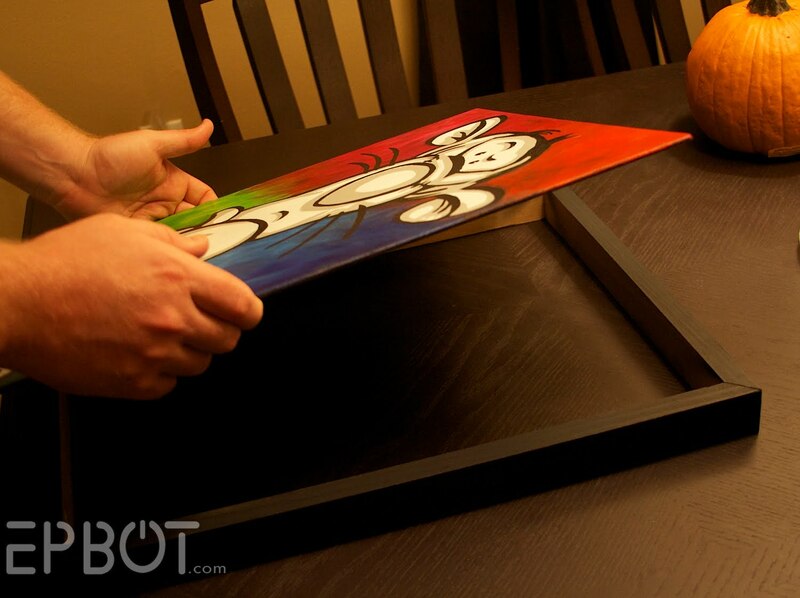 Attach velcro to the backs of different art works of the same size, and you can easily change out the artwork on the same frame. True confessions: I've been reading your blog for months, but haven't been brave/creative enough to comment. So let me just start with "I love your blog!" I'm always happy and inspired after reading it - thank you! And I learn a lot from your commenter community, too. This tutorial is great and perfect timing! Thanks! Thanks so much - for everything! You and John are teachers at heart! I love crafty things, but I'm all thumbs and live in a one-bedroom apartment with no powertools. However, I feel like I could do this if I had a little coaching with the proper tools. The finished product looks like Tigger is annoyed with Kermit's Rainbow Connection. I love any of the how-to-make-some-amazing-crafty-craft that you do on here, so tell John the more the merrier! I also love the sharing-of-awesome-geekiness and the oh-my-gosh-something-cute/funny/ridiculous-happened-to-me-storytimes. Bring on the EPBOT! I love that John does the post for cakewrecks on his birthday and did this the day before! Jen, you are so lucky! This is such an amazing idea. I wanna try it with cards! THANKS! This is a great idea--and looks so professional! I do think the miters make it look more professional, really, because of the way the wood grains are. I'll have to try this sometime--maybe when I'm visiting my parents with the fancy wood shop in the garage! I loved this! I have several posters that I haven't done anything with because I have yet to buy frames. I like John's idea better, though, because it adds so much class. Thanks for sharing! This is a great tutorial!! I always shy away from some prints for this exact reason...sometimes a frame just won't do it justice. Now I have a way to make them look great! Thanks for the tutorial. I think even I can do this. is that a border or a stencil at the top of your wall? NEW PROJECT! Thanks, John! Per EPBOT inspiration, I finished some shadowboxes over the weekend with my bee-yoo-tiful Hallmark ornaments in them. I will take some photos and share this week! 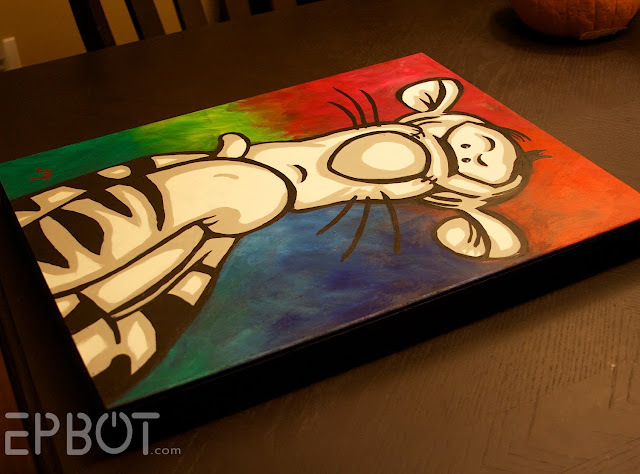 That's awesome - Tigger turned out great! Thanks for sharing, John. You and Jen ROCK!! This is an awesome idea for all my kids' artwork from school. It's usually an odd size and would cost a fortune to frame. I may experiment with Mod Podge to seal the artwork. Love the idea and quick tutorial! Just to add my two cents, if you're working with a paper product, sealing it is a good idea. They sell all types of sealers and varnishes, etc, but my favorite is good ol' fashioned Mod Podge and a 1" brush to create a cross hatch pattern over the paper. It gives it a subtle texture that mimics an actual painting. 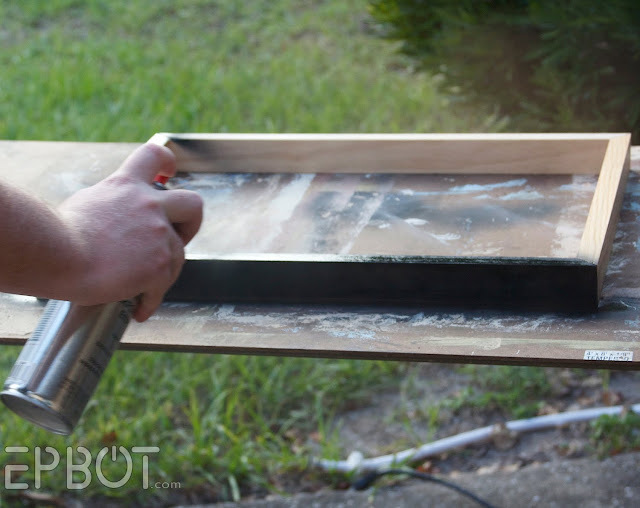 Just use a thin coat smooth to seal, let dry thoroughly, and then another coat on top with the cross hatch pattern. Here in Humid Florida, it is especially important to dry between coats or else your seal will feel sticky and actually attract dust instead of sealing it out. O.o WOW. Where did you learn to paint like that? ME WANTS YOUR PAINTING ABILITIES!! Harry Potter, Disney, the colour orange, Gerbera Daisies, big clothes pins.. you are just too awesome for words. I feel as though if we lived nearby you and I would get along smashingly.